The sellers moved out on Monday, and we got access yesterday and today to do the work the underwriters called for. We had Bob the Handyman for the professional guidance and lead on the work, but Jen and I put in a whole lot of physical labor ourselves. 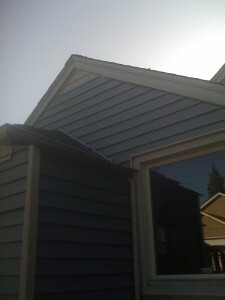 Jen went up on the roof of the kitchen porch to scrape and paint the bargeboards where apparently the previous owners ran out of aluminum flashing to cover them after covering all the other ones. The electrician has already removed the knob & tube wiring extending from that gable peak over to a hanging receptacle box in the pergola. We decided that merely replacing the rotted floor of the kitchen porch was the path of least resistance, as opposed to demoing the porch back to the original roof projection (that Jen is on above) and concrete steps. 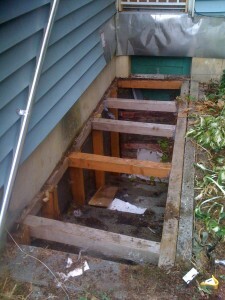 Bob the Handyman knocked out the rotted supports and replaced the base plates with pressure treated 2x6s. He cut the plywood and I screwed it in — I’ve never had a drill that could actually countersink a screw; even my corded drill doesn’t have that kind of power. Frame and plywood floor to replace rotted ones. 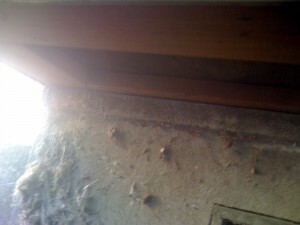 The underside of the kitchen porch showing the new frame. 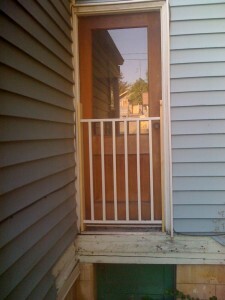 I built this railing at home on Sunday, and happily I measured everything correctly and it screwed right into the jamb. As it turns out, that door is not nailed shut and only has a little pushbutton lock like you’d find on a bathroom door. Great! 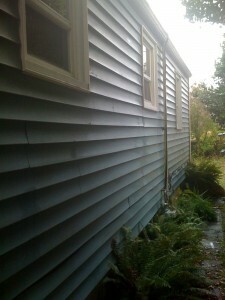 Jen cleaned off all the green gunge from this wall that had come down from the missing downspout. Along the way, she cleaned all the moss and dirt (it was like potting soil) from all the gutters around the house. No gunge on this wall either! Jen and Bob demoed the entire patio deck. The supporting frame was okay, but some of the planks were falling in. Bob suggested just patching the falling-down part, but we wanted the thing gone anyway. I was off doing something else, so I don’t have any photos of the demo. Apparently it’s very difficult to find vinyl siding in less than whole-house lots, so getting some to patch where the deck was wasn’t possible. 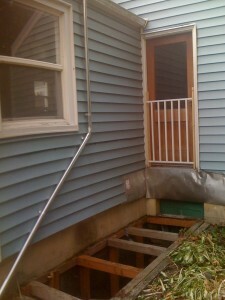 Instead, we installed aluminum flashing, which you can see behind the steps in the photo below.Â We flashed the back corner under the hanging door as well. I called our mortgage broker to confirm with the underwriter that flashing in lieu of patched siding was okay, and not only the underwriter but her manager as well approved the plan, so we’re good on that item. 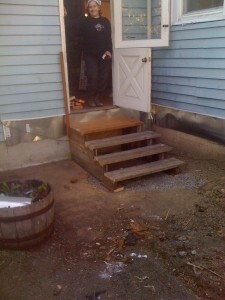 It turned out that the staircases off the deck were still pretty solid, so we salvaged one of them and put it directly against the house off the back door with a couple of bags of gravel to level the ground. I took this photo late in the afternoon when the first stick of the handrail was in place, but Jen and I were too tired to continue at that point so we went home. We also fixed the stairs themselves. What we had thought was a loose tread turned out to be the left-hand stringer split all the way across. (Why the previous owners thought that was okay not to fix I don’t know.) Bob cut a couple of 2×6 braces to push the stairs up and close the crack and a patch to bridge across the split and bond the upper and lower pieces together. The space was too cramped for me so Jen got her hammer on and nailed it all up but good. 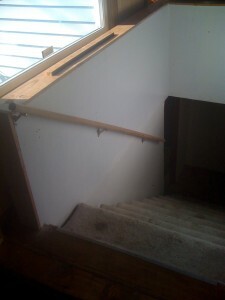 We’ll still want to replace and/or move the stairs later, but for now they’re way safer than they were. At that point, we’d been working from 8:00am to 5:00pm with a short break for lunch, so we quit for the day. Both of us were very sore, but luckily we had already scheduled massages for both of us that evening. 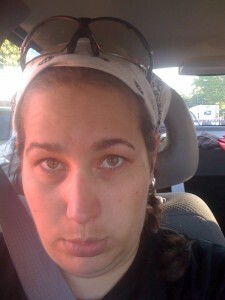 Jen went back to work today, but I took another day off and went back to the house at 8:00am again. 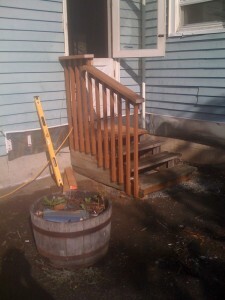 Bob built the handrail to the patio stairs while I held the level, but I got to use the nail gun for the last few bits. 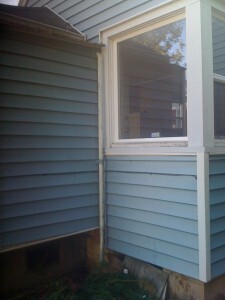 Bob and I put up the new downspout and angled it so it wouldn’t drain into the basement stairs. Bob checked the plywood roof of the kitchen porch extension and discovered that although the edge was rotting and looked bad, the rest of the sheet was perfectly sound and quite well attached. 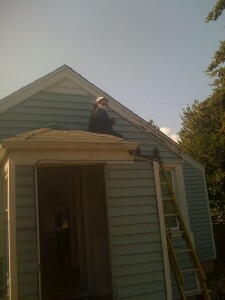 He then screwed clips in where Jen had noticed that the gutter was loose. At that point, we’d run out of jobs that we needed his help on, so he went off the clock, but was perfectly happy to gab for an hour about our plans for various parts of the house and all the systems, about which he had lots of very helpful suggestions. We may very well be re-hiring him to get the upstairs bathroom done as quickly as possible after I do all the demo. Bob took off and I went and got lunch. 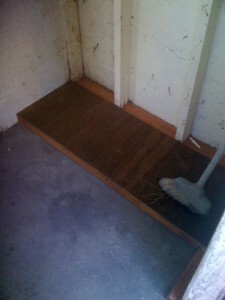 I decided that next I’d pull up the plywood cover over the access stairs. I figured the plywood was at most maybe anchored into the concrete in few places. Nope. I went to pull it up and about fifty pounds of stuff came with it for a couple of inches before I dropped it. I cleaned it off and took a closer look and discovered a nail head about every four inches all around the outside and across the middle in a few places. I set to pulling them all, which involved basically chiseling out the top layer of the plywood to get at them with the wrecker bar. An hour and a half later, I finally had the plywood up. This is what was underneath it. So basically, the only soft edge was where the 8-foot sheet butted up against the 2-foot sheet between the closest two braces. The rest of it was probably good for another five years or more. But, we were planning on opening up those stairs anyway, so it wasn’t a waste in the grand scheme — I just wish I’d been able to put it off and not have to rush through it. Then I thought that if the green gunge on the back walls was a problem, then the green gunge on the side wall might also be one even though the appraiser didn’t mention or didn’t notice it. Turns out it just needed brushing and rinsing; no cleaner was required. Tony the neighbor was very accommodating about letting us cut back his holly tree so it didn’t touch our house. 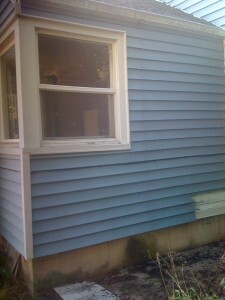 The last task on the schedule was dealing with the crawl space under the addition. Bob had already cleared out all the insulation from the access window in the basement and strapped up the duct running through it so it wasn’t in the way. 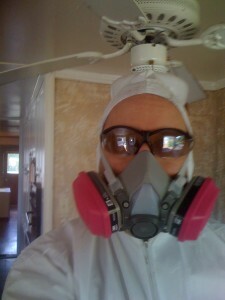 I put on the tyvek coveralls and the respirator mask and got to work. First, I pulled out all the existing plastic and loose insulation. The plastic wasn’t thick enough and I was afraid because there were rodent droppings on the part next to the access hatch there might be more on top of the plastic further in. Turns out that I was wrong — the droppings were only at the front, probably because rats had at one time nested in the loose fiberglass insulation around the opening. I had to crawl in and go all the way to the back to get all the plastic, loose insulation, and assorted wood scraps left over from insulating out of the whole thing. That was bad enough, but nothing compared to what was to come. Next I filled up five big garbage bags with the cleanup. I kept the respirator mask on for this since I didn’t want to breathe in any of that dust at all. Then a break for drinking a whole lot of water, since those coveralls theoretically breathe but I was already very hot and tired. Instead of pre-cutting the new vapor barrier sheets, I decided it would be easier just to roll the plastic out as I went along and then unfold it. I may have been wrong. Two hours later, I was done. There’s no photo since black plastic in a dark crawlspace would just look like a whole lot of dark. That was a job that I’ll be very happy if I never have to do again as long as I live. It’s very difficult to do hard physical labor when you have to lay on your belly and can’t even get up on your hands and knees. About every fifteen minutes I would have to take a break and basically just lay there and hyperventilate to get enough oxygen to keep going. By the time two full sheets were down (out of three) I was exhausted and ready to stop, but just had to power through and finish. 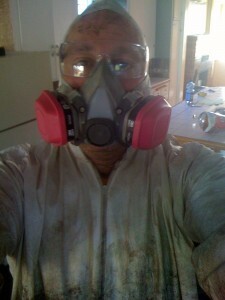 The respirator and coveralls were entirely worth the money and then some. I was soaked in sweat but hardly dirty at all, and my lungs are fine instead of being filled with dirt, dust, and fiberglass. 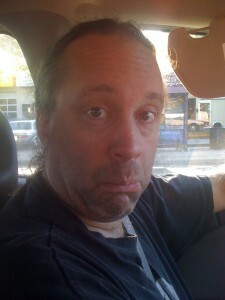 At 6:00pm I was all loaded out and finally able to head home. Four ibuprofen, two bowls of chili, and one of Jen’s Flexerils later, I’m feeling a lot less stiff and sore, but I make no guarantees about how I’ll feel in the morning. Tomorrow, the appraiser goes back to sign off on all the items on the underwriter’s list. Saturday we meet with an escrow officer and sign documents and give her a cashier’s check. Hopefully the underwriters will expedite approval so the loan will fund Tuesday, and then we can close Wednesday after the escrow records the transaction with the county. Then our realtor hands us the keys and the house is ours!